15-October-2009 Hi Guys! This site is dedicated to TSU Alumni and anyone can share their thoughts and speak out their ideas freely. Hi George...how's life?We're already here in NZ for almost a year now. I'm so glad knowing that you are also a member of freakin facebook. We'll,it's pretty good we can actually get in touch...I enjoyed looking at ur pics. 0064-3-3396077 for landphone and 0064-21-079-2039 mobile. 03-October-2009 Friday 12:04pm Hi! I am at the Gateway Mall in Cubao QC cheking TOSHIBA's Display of laptops. How are you doing? 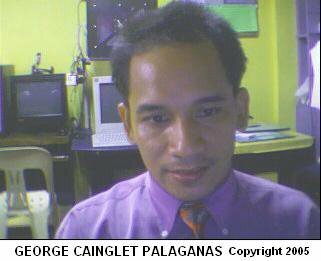 It's me George PS After typhoon ONDOY(international name: KETSANA) here comes typhoon PEPENG. The Philippines is under state of Calamity since flood is endless this month. See you! Is Kodak From Down Under? Hi Jess! Greetings of peace and joy! Aren't you going to greet me too on my birthday? I am exactly 37 years old today! Life is so fast we can't miss what we're soakin'. I appreciate the two pictures you sent below. I was almost crying for I got an exact semile. Regarding Cindy's pictures, I can't remember any except the one on the lobby with four us, you, Dante Sumaoang, Nilo Flores and I. The four of us are on an old Cindy's orange uniform with the three of you ,visor cap on, while I got my head gear on my hand. The backdrop was a modern art blown up picture of blue and red paint with two giant brushes and the huge picture was neatly framed on the wall. I have plenty of pictures spread all over the net. Obsession is a perfume and it's weird I have also rented a car in Oslo. Calgary reports me on a bad AVIS car wreck and whoever reported that, dapat ihulog sa mga bangin don. Maybe because directly from the plane, I went straight to Richmond Hospital in Richmond,British Columbia. And I took my Westjet flight from Calgary under a government program called Project Isabela . Obviously it's from that notion where they base those rumors. LOL. Jess, I am sending you some postcards on regular mail so where can I drop my mails now? You can write regular mails to me at 846 Aurora Boulevard, Kaunlaran 1109 Cubao, Quezon City. You must be amazed. The last time we have seen each other is at the Metrostar train station last year. As what I told you, I am just living around the corner. And it's sad we have very little time to talk. Alright, so keep on writing to me and I'll be keeping in touch with you. Iggy has still to respond to my e-mails. Has he sent you already any? Seen heaps of your pictures in your webpages. Is that self-obsession? Or say self-_expression? Well, there’s nothing like having the full freedom to do what you want yourself to do- ain’t it? I still have our pictures while we were still workin at Cindys. But I left them in the Philippines. I’ll be requesting my wife to scan it and email them to me. Here are some of my pictures. Not as “dead serious” as your poses are. Just some simple look at the camera. At work. In the office. In my room at the house where I live. I terribly miss home. It’s good you exerted the effort to contact me. After work, I’ve got nothing to do anymore. But even if I’m at work, I still can find time to open my emails regularly. Sent: Wednesday, 19 October 2005 2:39 a.m.
Hi Jess! It's nice to hear from you again. I am glad to hear another "howdi" from you. Hmmm... Regarding that song.... Seals and Crofts "You've got a friend", yah! I think we have gone into fiddling that in one of our guitar jamming sessions in the boarding rooms we had back in college, January's place I believe. Send in the Clowns by Frank Sinatra is one of my favorites alright, but it was my Auntie Shirley who can send you spine tingling sensations if you hear her sing it. Her contemporaries will always exclaim, "Uy! Si Shirley!" But with my "old voice", ngek! LOL. Actually, what I can render on the guitar is a poor version of Debbie Gibson's No More Rhymes. No more, no less. Ngek! “Winter, spring, summer or fall.. Still remember that song? We’ve used to play on the guitar- and you frequently play “Send in the Clowns?”. Yea, there are lots of contrasts in the world. It’s pretty hot in one place, cool and humid in another. Just like people. Each has its own peculiar characteristics that makes him different from all the rest. And I just love this place. Not much snow though. And not much searing sun. Just a good balance in between. I ride to work. I have my 49cc scooter. Handy and economical. I’ll still be buying my car in December. I’ll have enough money by then. For now, I’m stuck in this little wee bike. I can get my family anytime now but my problem is the house. I don’t want to be renting with them bec that would spell trouble for me. I’ll try to produce the house first, then get them, then apply for permanent residency. I can apply residency now but I don’t want them be left behind. I hope I can produce that enough money to secure a house for them so then it would not be that difficult to live here. Right now, they’re enjoying the good exchange rate for the money I’m sending them. It’s far better than what I’ve been getting while I was still there in the Philippines. I can make the 2months salary I am receiving there in the Philippines as a pressured supervisor (6days work) to just a week’s pay (5days work) as an electrician here. That’s what I’m trying to tell myself when homesickness gulp me up. It’s worth the sacrifice. It’s hard but it’s harder to live on just break-even. As we say it- isang kahig, isang tuka. No more, no less. I want better than that. I surely want to have my own car (which I can never produce in the Philippines even though we, couple are working together). That’s just very difficult to do. Unless- out of the blue- somebody gives us what we want. Or I can find a P10M check with my name written on it- which is ridiculously impossible! So here I am. Trying to make up for the “lost time” I did. And I’m enjoying it. There’s more to life though other than money. It’s the satisfaction and joy behind life’s imperfections. I try to be balanced every time all the time. The numbers are 0064-3-3396077 for my landphone and 0064-21-079-2039 for my mobile. So till next my friend.. Sent: Tuesday, 18 October 2005 9:27 a.m.
Hi Jess! How was your day? I know it's almost spring time in NZ and it's the time when the snow melts and the greens reappears. I know how it is to stay in a cold country Jess, for I have been into one(Canada) myself. But your season right now is the opposite of what they have there for it is fall time in the North American West. You should be glad since the problem of driving in snow will soon be over. Goodbye to snow tires and you can go on jogging and strolling again. The problem with snow is when it rains after the ice. That's the time you get a 'slush' on the road and it's too slippery to walk. Do you drive on your way to work, Jess, or you just commute? Have you been into some skiing or skating (toboganning) around? For these are just the outdoor things you can do during winter. How about shovelling snows in your carport and driveway? Are you experiencing them too. When I was in Canada , I fight off winter chills and winter depression by taking plenty of chocolates. And of course, use the home computer to reserve books in the Main library(VPL) and wait for the phone to ring saying the books are now ready for pick-up in the branch(Marpole) which is just a couple of blocks from the corner. And gobble up the books within the day while baking rotini(pasta) and pizza on the self-clean oven. Well, there goes the winter routine. And once in while go to skating rinks, where they have skates available for rent and also watch the latest Roger's Cable can offer. You see, very rarely people stay outdoors during winter. And Winter Solstice can be very uncomfortable since daytime are shorter than during regular season. So, that is, it is nighttime before four p.m. You just go out only to do the groceries and nothing else. It's the time when most of the residents in the area where I have been leave there homes and go on long holidays. They head for the "hotter" vacation spots like Florida, Cancun or Europe. But definitely I had a lot of fun on summer. Endless picnics, beach frolicking in Kitsilano and Jericho and Wreck Beach, bicycling in the whole of Van from Marpole to Downtown taking the Arbutus route and stay in Stanley Park the whole day. Trainspotting at English Bay, stroll in Robson and watch beautiful faces....it's like you died and went to heaven. British Columbia is indeed beautiful and you'll say there is nowhere in the planet I would want to stay but here. How about your family Jess? Noemi and your kids? When are you going to 'get' them there? Does NZ have an immigrant program for their foreign workers? Until then and God bless. Well, I might have lost track of it anyway but yeah, I think we often call you Georgie then. I never expected to come to New Zealand. In fact, my first choice was Canada, second was USA (or vice versa?! ), next was Australia and then UK. But how did I end up here? I honestly don’t know. Things had just happened so fast that all of a sudden my environment changed and then all I can say to myself is- “It’s good to dream- and work it out.” It’s good to wake up to a very fresh, cold air and enjoy the sun. Most houses have glass walls and sunrooms. Since the whole house floor is almost carpeted, I can just sit or lay down by the wall of my room and taste the sunshine as I ponder the day’s wonders (and what the heck am I doing here!!?!?!). Know what- New Zealand is pare Dante’s first choice and he told me that he almost migrated before we met again after 10years?! And I’m throwing that back to him as a challenge. He first became interested here and now, he’s still there and I’m already here. Ironically funny?! Kiwi’s are not that good in chess though. There are Chinese guys who are very good at it. It’s just one of the many recreational activities they have in here. It’s spring time here and gettin hotter now. But it’s not as hot as in the Philippines though. We can still bathe comfortably in the sun though it’s already 12noon. And long days are here as well. There is still sunshine until 8pm. It’ll just begin to darken around 20 past 8. They’re telling me it’ll even be longer days in summer (which is by December to February) when the sun shines until 11pm. By the way, if you really wanted to call me, I think you should make it around 8am Manila time. It will be about 1pm here. I’ll be relaxin and gettin ready for work by then. Alright my friend, til next.. Sent: Saturday, 15 October 2005 3:29 a.m.
Hi, Jess! I am glad you have leisure times on the chesspark in your area for that's a great thing to do. I know how you are very fond of chess and I can still recall how you and Iggy beat everyone to the hilt on that game. It's like playing crib and you end-up as skunk, that's what everyone feels everytime they play the game with the two of you. That area of your's is similar to Granville Island's in Vancouver where the show is mostly Asian revelry. If you will click the hypertext you will see that they have pictures but it wasn't the same as the Granville Island in the British Columbia that I have been. And the boats are not also on that area but they are all clustered in the Kerrisdale area of the Hudson River.Well, there are too many discrepancies like from below, Granville Bridge looks very much different.There is another area near Main Street in Vancouver called Chinatown where similar asian events take place but when I was there it's their version of Tin Pan Alley called ROBSON St. is what I love the most and it's where I hang around most of the time. It's close to cinemas, and their public library. (Click Hypertext for pictures)It's also close to Stanley Park. I am planning to return there as an immigrant in a few years time. I am puzzled by the numbers you gave. (See attached e-mails) Is it (0064)021-079-2039 or 03-339-6077 ? It's a good thing you have everything in place and the life you are living now is great as you deserve it. And I know too that you miss your family here in the Philippines a lot. I'll give you a ring anyday now so expect it my friend....reverse charge ha? Ngek! I am just kidding. Anyway Iggy(Dante Rivera) send me an e-mail too. Georgie was never blurted by Dante Sumaoang before, but it's you who oftentimes call me that then.NGEK! Sumaoang calls me Budsky! Your group(Rivera, Sumaoang, Tubay, Bumagat,etc.) is my second "cliche" in college after the "Waiting to Exhale" group of Joseph Dela Cruz, Harry Alimurong, Ramil Lambinoand I. And after your group was the veterans group of Francis Bunagan, Rafael Yumul, Regino Reña, John Aquino, etc. Yah, it's all now but reminiscing... reminiscing... okay see you around the information highway and until the next CHICKA! just want to say, must na? 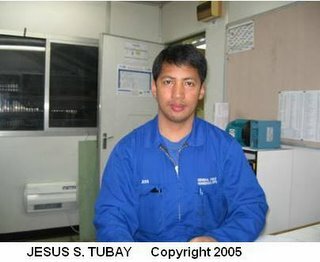 Mr Jess Tubay has just email to me you email address. this is your classmate at TSU. Hello buddy!! How are you?! This is a surprising thing from you! So you’ve changed you’re name??? Is that for real now? And your website is cool, man- just like your new name… Hmmmmnn.. So what are you doing right now?? Are you married or still single or just decided to live alone??! Pare Dante Rivera is trying his luck too. He’s been preparing his papers so he can come here hopefully sooner. I bet you are also in contact with him? I’ll be preparing a litany of goodies of New Zealand so you can know what it is to be like here. Til next my friend.. Keep in touch..
Oh silly me- sorry for that- here: 021-079-2039. The area code here is 0064. We have 5 hours difference. We’re advanced. Hi, it's good to hear from you again. Phone number? So you’ve concentrated in writing now?? And as I see it, I think you’re enjoying it more than I can imagine. So what made you decide to pursue that career? It’s really been an interesting “variation” of personality from you. You continue to surprise me as well. Even your voice, it’s very much different now. I think it is- yeah. What do you fancy as of now? I am really amazed by your “web of mysteries” in there- just like a bolt from the blue- just like your le quant..?? (does it dicotomy??? I myself is a bit puzzled..) Anyway, what a turn-around Georgie (as what Dante Sumaoang usually call you before) you are now. (At least as far I have known you- or did I really??). I emailed your webpage to pare Dante Rivera so he can contact you as well. Will that be alright?? By the way, my landphone is 03-339-6077. I am usually at home around 2am to 2pm. But I’m usually fast asleep until around 11am. My shift is on twilight- from 3:20pm to 11:20pm. Do some 2-3 hrs OT everyday for 5 days. (oh my- electrician jobs here are very easy… at least for me..). Go out every Saturday. Play chess with Kiwis and other non-pakeha at the Cathedral Square. Our chessboard is on the ground- a square is at least 1.5ft on the sides. The chess pieces are very big that you cant lift and move them with just one hand. They are quite heavy and holding them with two hands makes your life easier. To give you an idea- the pawns are slightly above knee height. The towering kings are approximately up to my navel. Or higher. And munching my souvlaki (a Greek food) while watching a game.. There are public performers at the square as well that after each performance or play they do- they ask for “donation” if you enjoyed their antiques. If you’re bored, you should still give because according to the performer, there’s no point in going home with both of you disappointed(!!). Right- so that’s it for now, my friend.. I hope I you will visit me one time here.. Keep in touch..
On those rare occasions when you send your messages in Ilocano, I should say those to you instead of the other way around. Nevertheless, here is my response in the language of "the olds".
" Castuy met laeng a ta napintas ken nasiyaat kumma nga kinanayon. Casta met laeng kenka kenni Noemi ken kadagetti anak yo. Bay-am ta sika ti pasarabuak to kadagiti set of books ko. Wen . Aggaw-awid uk pay met ketdi ngem saan nga kenanayon ta idi maikalabas nga Abril kettam ditoy site nga atoy http://drgeorgecaingletpalaganas.xanga.com/695392593/burying-memories-of-pinatubo-the-man-from-manila-dies-at-44/ didiay paragraph nga "On the City Scene". A lot of things have changed in Tarlac City since we vacated the place in 1992. EZ-Mart Grocery shop at Cindy's F. Tañedo is still there alright but the bakery transferred somewhere else. It's the formidable Cindy's Bakeshop and Dining section that holds mightily strong even today. Cindy's crews have a top-of-the-line uniforms now that approximates that of Mc Donald's and Jollibee's. Speaking of Jollibee, the branch at F. Tañedo was closed for good as Banco De Oro replaces it. Internet shops are ubiquitously everywhere today. SM Tarlac City is being built next to the Five Star Bus Terminal at the junction in Barangay San Roque. While at the Tarlac State University unibelt area, a Seven-Eleven store stands opposite the TSU Gymn. TSU Center for Computer Studies building that resembles De La Salle University Taft buildings along the LRT line replaced the old Wood Technology shop at the College of Engineering compound, Engineer Granita envisioned it to be a tall database center though, and a menacing Republic Act 6764 sign is conspicously displayed at the TSU perimeter fencing. Speaking of SM Malls, the newest and big ones at that, are SM Marilao, SM Clark, SM Rosales and the soon to rise SM Tarlac City. PLDT has removed its 108 and 109 service on public payphones. If you try to dial the hotlines today, you will receive an "invalid number" prompt message on the screen. All public phone lines are direct distance dialing enabled so just try using coins and cards when you place a call. 1-800 numbers are starting to flourish too but we can still see no sign of cardless texting function on the payphones yet. Cellphones can not still send text messages directly to an e-mail address tied-up with the domain service's IP addresses. The closest we can get to it is to send a voicemail to a Yahoo! Messenger account, where we specify the destination e-mail during configuration. (Translation: Here am I right now and thank goodness I am still blessed with good things in life and I hope it will be the same with you, Noemi and your kids. Don't worry and you will be the first to receive a set of my authored books one of these days. Yes. I go home to Paniqui still and the last one was April of this year. See this URL http://drgeorgecaingletpalaganas.xanga.com/695392593/burying-memories-of-pinatubo-the-man-from-manila-dies-at-44/ under the paragraph "On the City Scene". Jes sent you a message. "Kumusta kan George?! Sampolannak man iti librom tol. Nabasak met dagidiay poems nga inaramid mo man. Mandyak siguro masukdalen iti pagal-alaam ti 'lyrics' mo! ;-o Addaka pay laeng metro? Agaw-awid ka pay diay Paniqui? Annadam lang ta bagbagim nga kanayon tol.."
"Translation: How are you doing nowadays George? Can I get a sample of your books? I have read the poems you have made. It looks like I need to reach for the skies to get the depth of the sources of your Lyrics. Or there is still some kind of measure to it? Are you still going home in Paniqui? Just take care always, brother..."
Flag this message Alex Dizon sent you a message on Facebook...Monday, October 26, 2009 11:13 PM From: "Facebook" Add sender to Contacts To: "George Palaganas" Alex sent you a message. Re: http://www.facebook.com/l/d7c65;www.drivehq.com/bbs/getmsg.aspx/bbsID2066184/msg_id15691356/ref_id15230098/page0 "Nice to hear from you also, do you have news about Edgar & other batchmates? would be better if we could probably set a reunion??" To reply to this message, follow the link below: ___ This message was intended for drgeorgecaingletpalaganas@yahoo.com. Want to control which emails you receive from Facebook? Go to: Facebook's offices are located at 1601 S. California Ave., Palo Alto, CA 94304.
http://www.facebook.com/photo.php?pid=30597796&id=1427450153 Flag this message Re: I: [CHSTBATCH87] Fw: A small requestFriday, November 6, 2009 8:29 PM From: "Dr George Cainglet Palaganas" View contact details To: "Ma. Jesusa Agapito" 07-November-2009 Saturday Hi Toots! Thanks for the RECALL! You don't know how it is to be 41 and forgetting these things until you are there yourself! LOL! Give my regards to Angelito! Have you got kids? Until then, George Cainglet Palaganas, Ph.D. Current Mailing Address:(as of 19-June-2009) #21 Zamora St. Purok Maligaya 2 Barangay Poblacion SUR 2307 PANIQUI Tarlac Region III PHILIPPINES Phone: 001-206-339-2624 Washington Voicemailbox Fax: 001-206-339-9327 e-mail: georgepalaganas@yahoo.com.ph Professional Regulatory Commission License No. 0029594-98 Assistant Electrical Engineer Automated Phone Query: 00632-917-7777 SSSNo. :02-0837587-0 B-day:10/19/1968 URL http://drgeorgecaingletpalaganas.xanga.com Also Click http://209.131.36.158 --- On Fri, 11/6/09, Ma. Jesusa Agapito wrote: From: Ma. Jesusa Agapito Subject: I: [CHSTBATCH87] Fw: A small request To: "george palaganas" Date: Friday, November 6, 2009, 9:21 AM hi george how're you? my real name maria jesusa manlapaz-agapito,,,,,,,,,,,,,,do keep in touch, GBU ----- Messaggio inoltrato ----- Da: fatima de guzman A: alona.pascua@yahoo.com; chstbatch87@yahoogroups.com; dehliaocampo@yahoo.com; Gemmalyn.DeJesus@shell.com; joselitomendoza71@yahoo.com; Blesilda Bernal De Jesus ; Carolina Intal ; Catherine Fider Talavera ; Cor Flores ; Cris Sicat ; Dwayne Mallo ; Ela Revilla ; elizabeth de Jesus ; florence ocampo gelera ; Frances Pamintuan Martin ; Gomez ; Grace ; Jasper Hilario ; jimmy hasegawa ; Joan Datang ; Joel Ochoa ; Joy Olalia ; Kenneth Fernandez ; Lina Sicat Mendoza ; Lito Cenizal Inviato: Gio 5 novembre 2009, 15:43:11 Oggetto: [CHSTBATCH87] Fw: A small request A SMALL REQUEST Today, please take the time to say a little prayer. THERE IS IMMENSE POWER WHEN MULTITUDES ARE IN PRAYER. Dear God, I pray for fellow Filipinos, whose lives suffered the wrath of the last typhoon. Please grant us courage, to face the long road to recovery; give us enough grace, to accept Your will despite our huge losses; sustain us with Your love that will protect us from further harm; and guide us, that the way to You remains, despite the sadness and desperation that surround us. This disaster destroyed our possessions; took so many precious lives; and has now created a serious challenge for my home country to overcome... but nothing can ever take away, nor ever destroy, our FAITH. Where there is faith...there is hope. We entrust ourselves into Your Hands, Lord. Amen. All you are asked to do is to keep this circulating, even if it's only to one more person. Disclaimer : Information transmitted in this e-mail is proprietary to DAMAC Group of companies. It is intended only for the addressee and may contain private, confidential and/or privileged material. Review, retransmission, dissemination, print or other use of this information by the person other than the intended recipient is strictly prohibited. If you have received this communication in error, please contact the sender or notify info@damacgroup.com and delete and destroy the material from any stored format/computer. ito nasa malaysia ako. ikaw? ok! inadd na kita sa FB ko. san ang work mo nagayon? tagal ng panahon na wala tayong communication. George Palaganas: saan ka sa Malaysia? Benigno Macaraeg: so, saan ka nagwowork ngayon? Benigno Macaraeg: pano ginawa 2 synchronize sa FB ah? kasama mo ba c roy sotelo? Benigno Macaraeg: pre, kasama mo ba c roy? George Palaganas: sotelo...? or kakambal kong roy?(LOL)... classmate ko si roy sotelo sa elementary pre..
Benigno Macaraeg: ang ganda naman pala ng work mo. George Palaganas: married ka na ba? George Palaganas: sinong napangasawa mo? Benigno Macaraeg: taga ramos din. Benigno Macaraeg: dko napangsawa ung taga tarlac. pano pinagsama chat natin sa facebook? yung baldomero vidad dito ...si Jose Vidad ba yun? si Bien Baysa... napangasawa ba si Jessica? Got an iPhone or iPod Touch? Send free SMS messages and access your contacts on the go with Yahoo! Messenger for the iPhone. Get it now. Benigno Macaraeg: d mo sya kakilala kc d sya nagstudy sa atin...sa isabela sya lumaki. George Palaganas: Yung Baldomero Vidad sa Facebook, si Jose Vidad na taga sa may DPWH bago Tarlac ba yon? George Palaganas: Andiyan Ka pa? George Palaganas: okay...out na muna ako benny.... talk to you again... bye! Benigno Macaraeg is typing a message. Pre, i spend only 1 yr and suddenly i broke the tie. Now, i work here in Malaysia for 2 yrs. Magbabakasyon nga ako ng end of the month. Ikaw, kumusta na? Asensado ka na ah. D na kita mareach. Benigno Macaraeg: d2y yak malaysia. Benigno Macaraeg: kumusta t krismas celebration? Benigno Macaraeg: adda ngamin t bigla nga tawag, isu nga inserrak nga dagus . George Palaganas: kuwartom ata ayan mo? Benigno Macaraeg: aywen kunam pay. George Palaganas: matandannam iddi agkakwarto ta pay? LOL! George Palaganas: Malaysia ayad tta? Benigno Macaraeg: adda ka t work? George Palaganas: christmas tatta ... LOL! George Palaganas: ania oras mod ta? Benigno Macaraeg: parehas lang dita PI. George Palaganas: ah... ampay...adda ta cayon nga permanent resident ayya? Benigno Macaraeg: saan met ngem adda t nagbalayan da nag inted t co da. George Palaganas: ah... adiay kadwam didiay picture ti facebook... ania nagan na didiay? George Palaganas: aggap-aphuy can ca? Benigno Macaraeg: katabahok met laen daydiay dita manila idi. Benigno Macaraeg: awan ngarud ket. George Palaganas: ububing ka anniya... mga mannu tawen mu iddi?? George Palaganas: ah... wen ...ta ahead kayon nga naggredwar ti engineering kaddacami.. ni Bien.... TCT met laeng aya? Benigno Macaraeg: nalaing ka nga talaga no panggep t comp. Benigno Macaraeg: uray sadinno nga anggulo. Benigno Macaraeg: ni gary mendoza sikat dta PI ah. Benigno Macaraeg: ni yumul adda t cueshe? Benigno Macaraeg: ngem arnel ket addan t the journey band ita. Benigno Macaraeg: jorge gupungin ta chat ta agur-uray ni bien kanniak. George Palaganas: kasla ... ag-Wor-World Tour da? George Palaganas: wen sigge garrud... iapaw-it ko ti transcript ti chat ta idta e-mail mo.. ania? bye! George Palaganas: agdiggos can bro...LOL! okay jess... where are you right now? e-addie mo and phone again? so how is the poetry saga going? george its 1030PM here have to go to work tomorrow catch you next time!